You know the Bible says that God is love, and you believe it. You agree with the idea that He loves you personally, too. But do you experience His loving touch in your life every day? Or does He often seem far away? Pursue God. God has promised that if you seek Him with all your heart, you'll find Him. He's available, knowable, and responsive. Decide to make a relationship with Him your top priority, building everything else in your life around it. Expect to discover God pursuing you as you pursue Him. He understands everything about you and knows where to find you. God wants you to find Him, too, rather than just playing a game of hide and seek. As you reach out to Him, He will reach out to you. Commit. Don't settle for just casual contact with God, as if you're dating Him. Move beyond a casual relationship to a fully committed one. Passionately devote yourself to God. Instead of just believing in Him, live for Him. Do your best to live out your faith in every part of your life, all the time. Trade religion for relationship. Your faith isn't defined by the religious activities in which you engage; it's defined by the quality of your relationship to God. Rather than focusing on the rituals you perform, the programs you attend, or the service you undertake, focus on the reason behind doing all of those things -- your love for God. Let go of activities that keep you too busy to invest the time and energy you need to invest in your actual relationship with God. Don't become so busy that you don't leave room in your life for God to do something new; expect Him to constantly be doing something fresh in your life. Ask God to help you avoid pride and self-reliance from doing too much while also avoiding guilt from doing too little. Rely on God's unlimited strength rather than your own limited abilities, and make sure your motivation for any religious activity is to express your love for Him. Overcome condemnation. If you feel like God is disappointed in you because of what you've done, or even because of who you are, the resulting guilt and shame will alienate you from Him because you'll be insecure about approaching Him. Ask God to heal your soul from whatever is causing your sense of condemnation. Confess your sins, repent of them, and embrace the grace that God freely offers you. Instead of working for God's love, work from it as a foundation of security. Remember that, although you'll always be a work in progress, your standing with God and your future are secure, because God is the author and finisher of your faith. He is always willing to meet you where you are and help you grow. Rather than worrying about how perfectly you're living the Christian life, focus on how often you're turning to God, and trust that His love will prove more than enough in transforming you into the person He wants you to become. Stop overdoing it. Although it's noble to try to live a good, selfless, and productive life, if you're too driven and busy, you'll end up actually moving farther away from the life God wants you to lead. Take an honest look at how you're using the limited time and energy you have. Make whatever changes you need to make to ensure that your activities don't eat up the time you need to develop and maintain healthy relationships -- especially with God. Deal with your pain. The pain you experience in this fallen world can create bitterness in your soul if you don't deal with it, and that bitterness can block your intimacy with God. Admit to God that you're sometimes angry at Him for the bad things He allows to happen, even though you know He doesn't cause them. Freely express your frustration to Him, knowing that He cares and understands. Then decide to trust Him to do what's best, no matter what the circumstances look like from your perspective. Listen for God's voice. Ask God to help you notice Him speaking to you in everyday life. Pray for the Holy Spirit to renew your mind and empower you to recognize God when He communicates with you. Turn down the noise in your life that's keeping you too distracted to hear from God. Expect that, if you give God an open heart and a listening ear, He will speak to you regularly in specific and personally significant ways. Be grateful. Negative attitudes like self pity are dangerous to your soul, because they hold you back from growing spiritually. But gratitude gives you the freedom you need to move closer to God. Make a daily habit of noticing the many ways God has blessed you, and thanking Him for them. Ask Him to help you stay focused on your blessings no matter what your current circumstances. If you place your trust in God even during tough times, He'll honor your faith by drawing you closer to Him. Join God where He's already at work. Stop trying to make good things happen on your own, and instead notice what God is doing around you and decide to join Him. Each day, surrender your own agenda and ask the Holy Spirit to guide your decisions, so you can accomplish what God wants you to accomplish. Remember that it's the work God does through you that counts, not the work you do for Him. Fulfill your purpose. Pay attention to the talents and passions God has given you, and decide to use the limited time you have here on earth to use your talents passionately to fulfill His purpose for your life. Check in with God regularly for guidance. Then act on what He tells you, trusting that He will help you every step of the way. Trust God with your marriage and family. God understands all the joys, sorrows, and risks you're facing as you strive to be a good spouse and parent. Pray about every family situation, and rely on the strength He'll give you. Remember that He is right there with you, your spouse, and your children -- ready to help with anything you face together. Trust the future of your family and everyone in it to God. Forgive. Realize that you can't truly be close to God if you're at odds with people. Be willing to pursue forgiveness, reconciliation, and restoration with every broken relationship you have. God expects you to forgive others because He has forgiven you, and you can count on Him to help you through the process. Pray often. Keep in close contact with God through frequent prayer. Be assured that God accepts every sincere prayer, whether you're uttering a few brief phrases on the run or pouring your heart out to Him in an extended prayer vigil. But when you pray, don't just talk to God; be sure to listen to Him, too. Write down important insights He gives you. Obey what He tells you to do. Expect that as you listen more to God and respond more to what He says, it will become easier for you to recognize His voice. Intercede for others. If you sense God leading you to pray for others, do so in humility. Never presume that you know what's best for them, but be willing to help them by presenting their needs to God in prayer, trusting that He will answer according to what's best. Guard against deception. Discern whether or not messages you hear spiritually are truly from God by: judging the fruit of those messages (they should move you closer to God and more loving toward people, rather than leading to self-aggrandizement, manipulating others, or actions that harm or deceive), staying under spiritual authority and in fellowship (such as by respecting a pastor you trust and being accountable to other mature Christians), making sure the messages are consistent with the Bible as a whole (God-given messages never contradict His Word), remembering that God often confirms His thoughts in more than one way, and learning to recognize counterfeit messages. Invite God to pour His love through you. Trust God's love to fill up every empty space inside your soul, overcoming every longing, unmet need, and loss. Welcome His love into your life fully, so that it transforms you and flows through you out into the lives of other people, transforming them as well. 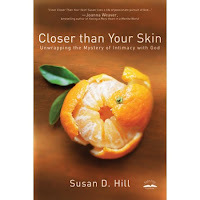 Adapted from Closer Than Your Skin: Unwrapping the Mystery of Intimacy with God, copyright 2008 by Susan D. Hill. Published by WaterBrook Multnomah Publishing Group, a division of Random House, Inc., Colorado Springs, Co., www.randomhouse.com/waterbrook/. Susan Hill is an award-winning feature writer and a leader of interdenominational women's groups, where she frequently hears of the common longing for authentic Christian faith. She also serves on the board of the Uganda Orphans Fund, a non-profit Christian relief organization. Susan and her husband, Duncan, have three children and live in Montana. This article was taken from Live It!, a free newsletter from Crosswalk.com - the world's largest Christian website. Subscribe today. Oh....Yes, God is in my heart. A heart relationship is much better than head knowledge only.